Hi, again! 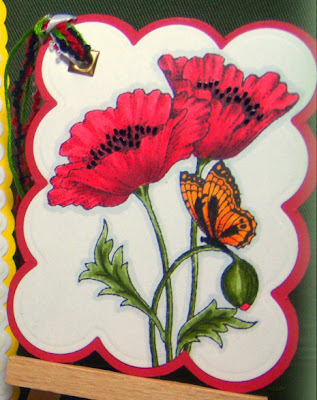 It's Poppy time at Chocolate Baroque! 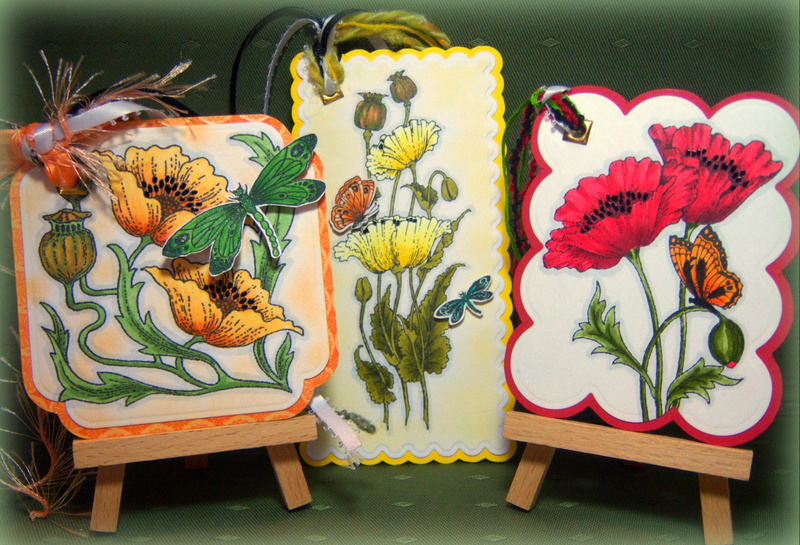 With the new release of the Pretty Poppies set, you have some absolutely beautiful stamps to play with, and it's a hard choice as to which one to use first! Just get them all inky! Here's some tags and a bookmark made using the poppy stamps in this set. Enjoy! Welcome, friends! I know I've said this before, but my husband says I should have been born in Victorian times, but only so I could wear the hats, gowns and jewels! I just love the images from that era! They are so romantic! 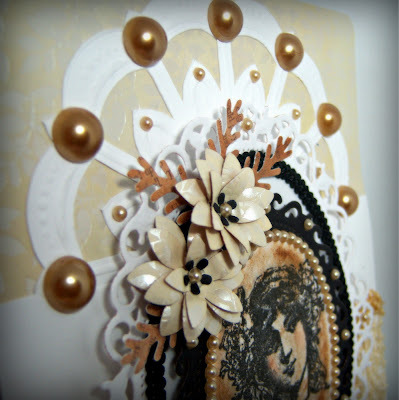 This “Cameo” image is from Chocolate Baroque, and is just beautiful! I wanted to make it a pretty simple card, but as usual, the more I work at it, the more ends up on it, and it turns into something that looks like I spent hours on! This little lady was discontinued, and I can't think of why, because she's so beautiful! I am posting this card because I used a large background stamp from the brand new stamp set, Dusky Damask, from Chocolate Baroque on the inside. Below is a look at this new set, and you can click on the picture to go to the Chocolate Baroque website for more information, or to order it. I stamped the image in Memento black ink of white cardstock. The Tim Holtz Distressed ink, Vintage Photo, and Antique Linen was used to “age” the woman. Just the tiniest bit of lightest pink was placed on her cheeks, using chalk. I used Spellbinders Small Ovals to cut her out, and glued a string of off-white pearls around the cut edges. The white card base is 10” x 6” tall, and score in half to make a 5” x 6” card, with a side opening. 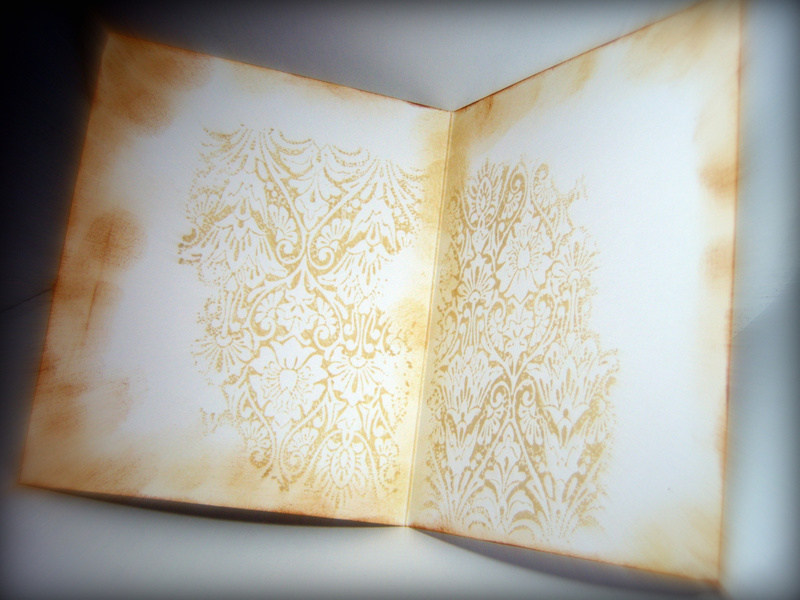 The tan patterned paper is from DCWV cardstock stack called “Linen Closet”. It has an embossed leaf design, and parts of the leaves are shiny, as you can see in the photo. It was cut to 3” x 5”, with rounded top corners, before attaching it to the top of the card base. I cut another white panel to 5” x 6”, and embossed the Marianne plate at the top about 1/8” below the top edge. Using a craft knife, I cut out the “windows”, and around the top of the “fan”. The bottom corners were rounded and this piece was centered over the tan and white card base, after applying the lace and trim. The lace and trim were cut to 6” long, with ends folded over to the back of the white “fan” piece and taped down (or use ribbon adhesive strip). Next, I die cut one of the 2 ½” wide Floral Ovals out of black cardstock, and placed tan pearls around the border as shown. I cut one of the largest Floral Ovals in white, and placed small tan pearls at the “directional” points shown. I used Scor-Tape in 1/8” wide to attach the ¼” wide black gimp trim to the white oval, just inside the pierced dot area. Dimensional adhesives were used on the back of this oval to attach it to the front of the card, on the lower two-thirds. The Cameo was centered on the black floral oval and glued flat, then this was mounted with dimensional adhesives to the center of the white floral oval. Large tan pearls were placed at the bases of each scallop in the top of the “fan” and small tan pearls at the points of each arch below that. The flowers and leaves were punched from a scrap of the tan embossed patterned paper and the black cardstock. They were assembled with glue after shaping them with an embossing stylus and foam pad. 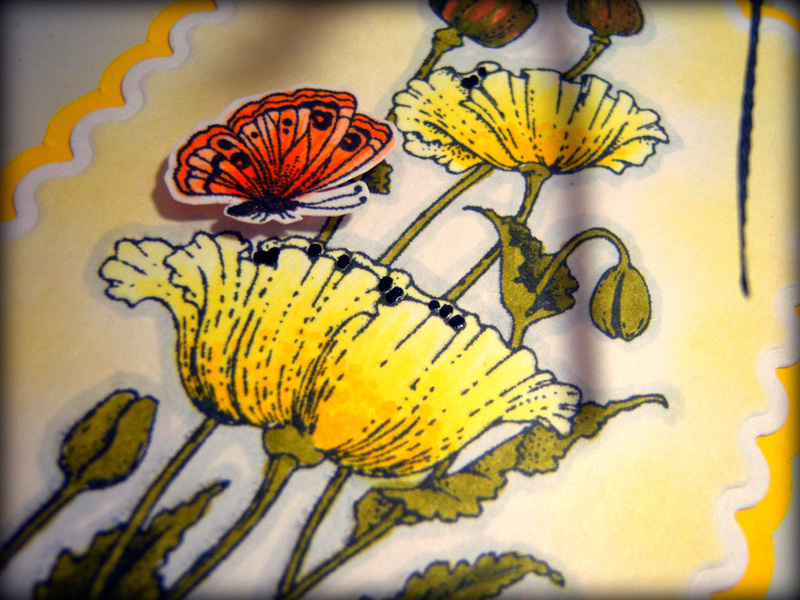 A tiny butterfly was used as an accent. 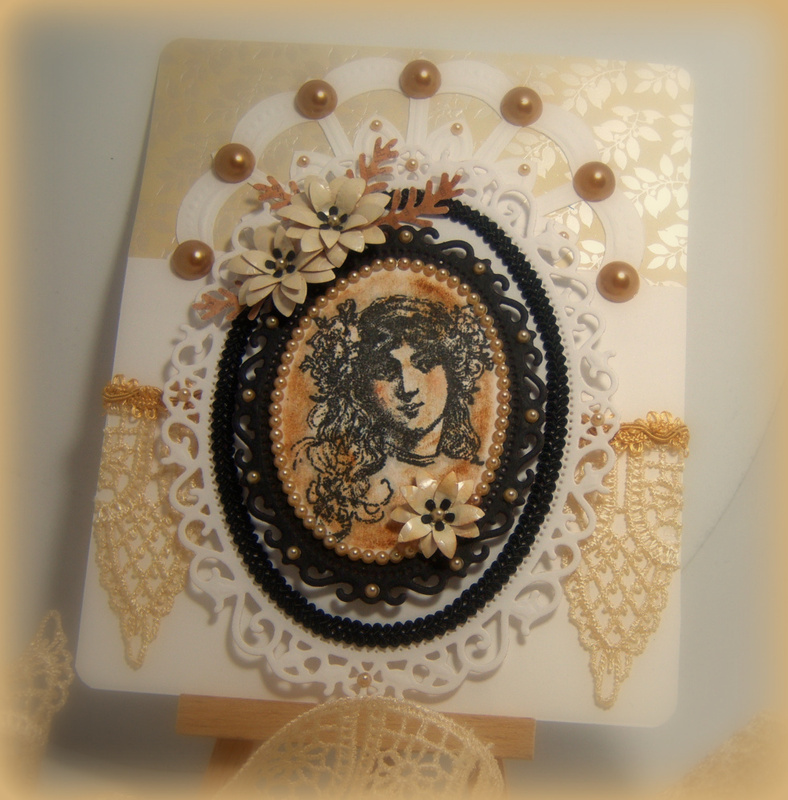 The inside of the card was stamped in the Distressed Vintage Photo ink using one of the larger background stamps from the Chocolate Baroque set, Dusky Damask. 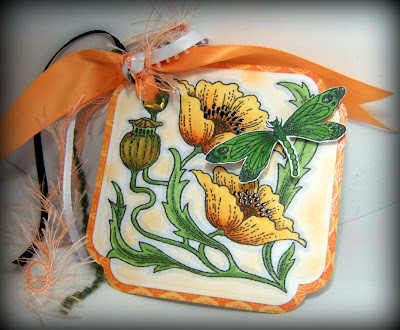 I used a small sponge dauber for the edges in the same ink, and added a little of the Antique Linen on the edges. I really enjoyed making this card, and I’m sure you will too! The supplies needed to make it are listed below!